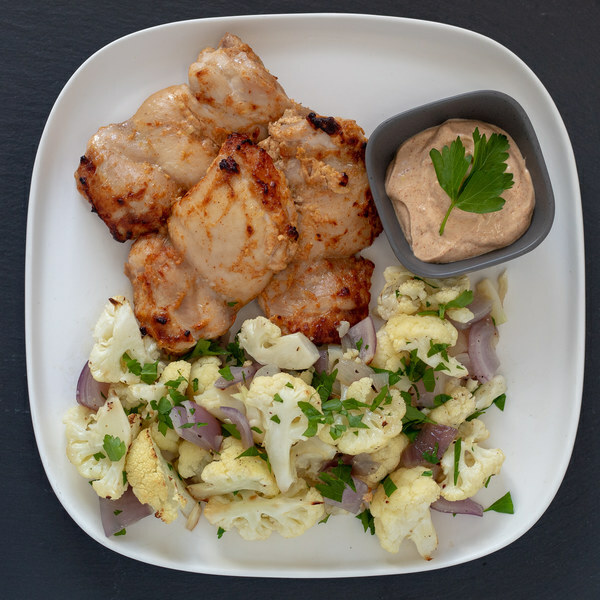 ← Sheet Pan Chicken Tikka Masala with Roasted Cauliflower & Red Onion. Peel and mince or grate the ginger. Peel and mince or press the garlic. Set half of the garlic aside. In a medium bowl, combine ginger, tomato paste, cumin, paprika, cayenne, and salt, with half of the garlic, and yogurt. Add chicken and toss to coat. Wash cauliflower and cut off the leaves. Separate into small florets and cut the thick stems into smaller pieces; transfer to a sheet pan. Peel and cut onion into ½-inch pieces; add to the sheet pan with the cauliflower. Toss cauliflower and onion on the pan with oil and season with salt and pepper. Arrange in a single layer and place in the oven. Roast until the cauliflower is fork-tender (about 18-20 minutes). Transfer the chicken to a sheet pan, spreading the pieces out in a single layer. Place the pan in the oven and roast until cooked through (18- 20minutes). Meanwhile, combine olive oil, paprika, cumin, salt, and remaining yogurt and garlic in a medium bowl. Wash and dry parsley. Shave leaves off the stems; discard the stems and mince the leaves. Once cooked, remove the cauliflower from the oven and toss with fresh parsley. To serve, arrange the chicken and vegetables on plates, and top chicken with a dollop of yogurt sauce. Enjoy!